It’s no wonder that many visitors want to buy a sapphire in Sri Lanka. Widely acknowledged as one of the world’s best sources for blue sapphires, the country is also famous for their orangey pink padparascha sapphires. Princess Diana, and now Kate Middleton’s 18-carat sapphire ring is widely acknowledged to be of Sri Lankan origin. Lots of other gemstones are sold here. Moonstones are mined in the country, as are rubies, garnet, aquamarine, spinel, topaz, alexandrite, to name a few. Jewellers are a dime a dozen here. Drive around Colombo and you’ll see lots of signs for discount gems. The same goes for Galle Fort – there’s a jeweller on practically every street. Having lived in Sri Lanka for three years, I’ve visited lots of gem workshops and seen the cheeky tricks that can befall the not-so-savvy gemstone purchaser. The truth is, I’m no expert and essentially anyone could sell me a blue stone and tell me it’s a sapphire. Or any other gemstone for that matter. Fun fact – red sapphires are called rubies. Rubies have exactly the same structure as sapphires and are a red corumdum. However, all other colours of this gemstone are considered sapphires. Sapphires are in the corundum family; and corundum can come in all colours of the rainbow. Sri Lanka is particularly famous for blue sapphires and salmon/coral padparascha sapphires. The name padparascha originates from the lotus flower. Of the blues, Kashmir blue sapphires are the most famous but exceedingly rare as only a small number were mined and production stopped around the 1900s. Today, most of the world’s top quality sapphires come from Sri Lanka, Madagascar or Burma. Thailand mines a wider range of what is generally considered to be lower quality sapphires. All locally sourced gemstones are sold duty free in Sri Lanka and that there are only two major gemstone exhibitions a year. Check the Sri Lanka Gem and Jewellery Association’s website as the official events are usually listed on their calendar. Speaking from personal experience, if you hop into a three-wheeler and happen to look like a tourist, chances are that two times out of ten you’ll be offered a trip to a gem shop. Common sales pitches include ‘last day of exhibition’, ‘duty free’ or ‘factory price’. 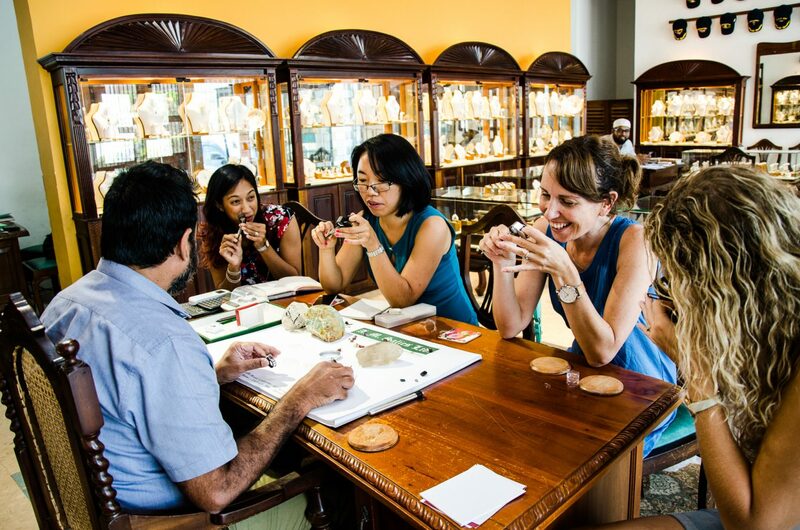 With so many jewellers in Colombo, guides and tuk tuk drivers often receive a sizeable commission (up to 20-30%) for bringing in customers. I strongly recommend that you avoid going to the workshops touted by three wheeler drivers – quite simply, you are never going to get a great deal after paying the tuk tuk commissions. More likely than not, you’ll be sold a poor quality stone or worse, a synthetic or imitation gem. The less reputable shops know that tourists are a one time thing and usually don’t return. After all, if you’ve been sold a diffused (dyed) stone but only find out after having it valued your home country, there is not much you can do to get your money back from the store in Colombo. I’m not saying that all gem stores are bad – that’s far from the case. What I am saying is that unless you are knowledgeable about gems, it’s easy to be duped. To the untrained eye, any shiny stone could pass as a high value gemstone. Dodgy sales tactics exist from a scale of outright scams (like selling coloured glass as gemstones) to less hard to spot tactics like selling cheaper Thai sapphires as Sri Lankan, or cutting a stone improperly to maximise its weight. Unless you have a good basic knowledge of gemmology and generally know your garnets from your rubies and spinels from your sapphires, I recommend going to a trusted gemstone dealer with a history of good service. Even as a repeat customer I’ve had no shortage of issues ranging from low quality stones, to poorly crafted settings where stones fell out. For that reason, I now use and recommend Salies Jewellery on Galle Road. Infinitely patient and with an unwavering attention to detail, Isam Salie is a fourth generation gemmologist who really knows his stuff. I sat down with Isam recently and he talked me through some of the most important things to know if you’re planning on purchasing a gem here in Sri Lanka. Almost all the information below was given to me during a crash course in gems that Isam gave me – but first, a bit of information on Salies. Salies is a family run jeweller that’s been operating since 1907. It is currently run by Isam Salie, with help of his mother Marzy. Isam’s wife, Shazie is often in and about the shop too. The best thing about Salies is that there is absolutely no pressure to buy. Each customer gets the same focus and attention, whether they’re spending $500 or $5000. While I was there, a gentleman came in and spent three times what I was about to and Isam didn’t even get out of his seat, knowing that the gentleman was in good hands with another staff members expertise. They are the kind of people that go above and beyond to get things to you. One time, Isam personally delivered an engagement ring to a customer on holiday so that the customer could propose at the beach. The other thing I’ve noticed is that they listen. I’ve had a lot of people tell me about desirable colours and preferred cuts, but I have preferences of my own. It’s a bit like going to a hairdresser – part of the skill is technique but the other part is actually listening to what the customer wants instead of just doing what you think is best. A quick glance at TripAdvisor will show you that Salie’s is the jeweller of choice for the diplomatic community here in Sri Lanka. They may be slightly more expensive, but that extra goes into quality and workmanship. For instance, here are rings from two different jewellers side by side – it’s a bit of a long story as to how I ended up with two. The reason I have two rings is because Salies mistakenly replicated the first ring without transferring the diamonds – so in other words, disregard the white stones. It’s a good chance to look at the difference in workmanship. On the bottom is the ring made by Salies and above it is another jeweller, who I don’t think it is fair to name. The reason I say that is because they are different pieces at different price points. Bottom: I asked Salies to remake the ring because I didn’t want to run the risk of one of the diamonds falling out – it was irreplaceable for sentimental reasons rather than for its value. Isam explained that silver is softer and he could remake it in silver, but thought white gold would hold up better, especially if it was a daily wear item. I mentioned that if we were considering doing that, would it be worth getting new sapphires – I wasn’t that keen on the sapphires used in the ring, not because of the colour but because they lacked sparkle or lustre. 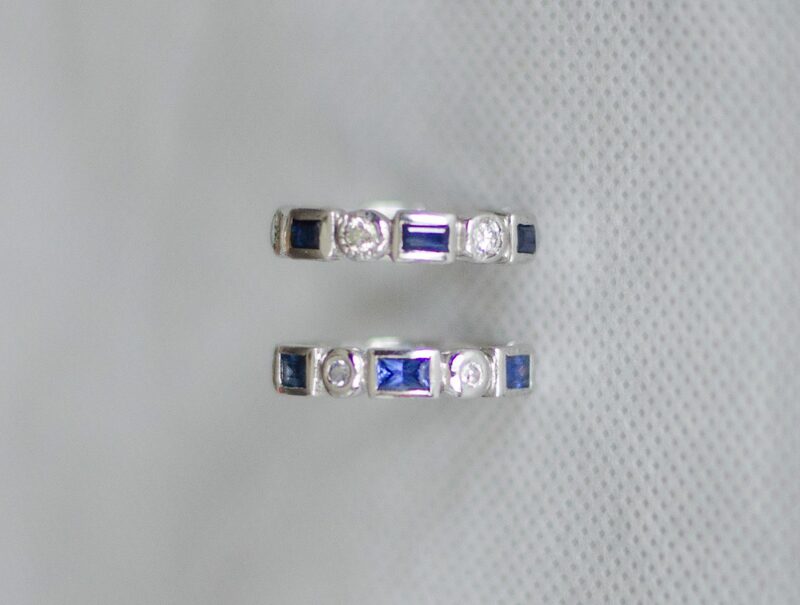 Total cost = US$280 (4g of white gold at $40 per g, and $120 for the sapphires). Just to be clear, these are two different pieces at two difference price points. But the difference is not just in the materials but also in the time taken to explain why they do things a certain way. The best way to know what you are getting at Salies is to have a look at another jewellery shop. When you meet him, I have no doubt that Isam will encourage you to do the same. Admittedly, I haven’t encountered anyone who’s bought a chunk of coloured glass yet. A more likely scam is selling synthetic or imitation stones misrepresented as the real deal. A synthetic stone simply means that the stone was not made in nature; it was created in a lab environment. There’s nothing wrong with that as long as you are told upfront that the stone is synthetic. For instance, lab created diamonds are becoming increasingly popular due to their lower cost. With imitation though, things get a little more complicated. It covers everything from coloured plastics to coating stones in pigmented oils in order to reduce the appearance of cracks and inclusions. The most common of treatments are irradiated or diffused stones. Gemstones can be subject to irradiation to enhance colour, or coated in a coloured layer – essentially dying the surface to make the colour more desirable. Around 1984, blue sapphires started appearing almost by the wheelbarrow loads. It wasn’t until a few years later that gemologists discovered that they were actually diffused stones. Due to advances in the technology, it can be incredibly hard to tell whether a stone is diffused or not. Only a few years ago, a friend’s visitor purchased a sapphire for a four figure sum, only to later find out it was diffused and not worth a quarter of what she paid for it. Gemstones are sold by carat weight, so another thing to watch out for is poor cutting of stones to maximise weight. Stones may be asymmetrical or unevenly cut, so make sure to inspect them closely under a loupe. If you’re planning to spend a significant amount of money on a stone or a piece of jewellery, it’s worth your while to shop around so that you know what’s out there both in terms of price and quality of stones. I’ve had a lot dealers tell me that ‘inclusions show that the stone is natural’. While that is correct, too large or too many inclusions are a sign of poor stone selection or lack of skill during cutting. It is up to you the kind of inclusions that you are comfortable with, but I prefer inclusions to not be obvious to the naked eye. Colour and clarity determine the value of a gemstone, and any significant visual inclusions will affect its valuation. Sri Lankan gemstones are especially renowned for their outstanding colour and clarity. It is not uncommon for dealers to mix in cheaper Thai sapphires into their stock. If you are after a Sri Lankan stone, make sure to ask for one. Lastly, look at examples of the shop’s jewellery to check out their workmanship. Are the prongs secure and evenly spaced? Is the detailing even all around? Can they execute complicate designs? High quality workmanship means that a jeweller has invested in their staff and tools, and sets a high-end jeweller apart from your average joe. Jewellers may volunteer information about a stone or a particular piece, but you shouldn’t rely on them doing so. It is your job as the buyer to ask the questions that will result in you leaving with a piece of jewellery that you are not only happy with but is also a good spend of your money. With the help of Isam at Salies, I’ve put together this list to help buyers make sure that they are asking all the right questions. Always inspect stones with a loupe. You will be able to see inclusions more clearly and get a better idea of the quality of stones. It also signals to the seller that you have a good idea of what you’re after. If you ask for a loupe and are provided with a magnifying glass, ask yourself what the jeweller is trying to hide – a magnifying glass provides 2-3x magnification whereas a loupe is 10X. If you are after a Sri Lankan sapphire, ask for one. If you don’t ask, you leave yourself open to having a stone from elsewhere. If you are spending over $200, your jeweller should provide a certificate stating the origin of the gem, as discussed. Is a white sapphire that’s been coated in blue/diffused to blue still a sapphire? Technically, but it might not be what you’re after. Make sure to specifically ask what treatments the stone has undergone, and compare this with the final certificate you are provided with. If you’ve purchased something and are in doubt, the National Gem and Jewellery Authority will be able to verify stones for you if you make an appointment. The cost varies between 1500 -3500 LKR for reports, and can take up to three days. They will not speculate on where your stone originates from though, and they do not provide valuations. Be warned, their website is notoriously badly maintained and the person who answers the phone may or may not speak English. Go in and and tell them that you read about Salies on Tash’s blog, and I’m sure you’ll be well looked after. *this is not a sponsored post. I receive no commissions and pay for the items that I purchase at Salies. If you’ve found this post helpful, please drop me a line via the comments below. I mostly write about food but wanted to share my experience and help tourists and visitors with their jewellery purchase in Colombo. Hello Gary, that would depend on a few things aside from the clarity, color and if the stone were heat treated or natural. Assuming that it was heat treated (as 8 out of 10 stones today tend to be heated to optimize color) the price range would vary from about $1,250.00 to about $1,700.00 approx but give us call or drop by at the show room Monday through Sunday and you can see a selection of stones at various price points. To be completely honest, anyone could sell me a blue stone ‘of great quality’, tell me was a sapphire and I’d likely believe them. There are so many things that change the value of a stone – not least its colour and proper craftmanship in the cutting. Even until recently, I have had trouble telling the difference between royal blue and cornflower blue. As an example for proper cutting, let’s say you pay $1000 for a 3 carat stone at shop X, but it has an average, not bad cut. If the stone were cut to its best, it would go down to say 2.6 carat – you’d be paying more per carat but getting a stone that reflects light and colour better. I’m going to try to write up a more detailed post about sapphires in the near future and will try to cover some of it. I’m not trying to be difficult, but ultimately, it is you as the consumer that gets to decide what something is worth, as well as how and where to spend your money. Do your research. Go and see other shops and other stones. All else failing, go a reputable shop with a established history. Could you please provide me an estimate of 5 carat yellow Sapphire? Also, do you take orders from India and ship it to here? I am so glad to have found your post. We are planning a trip to Sir Lanka next week and I was looking for more information. I definitely will make a trip to see Isam for a purchase that will be the memento for my trip. Thanks so much for posting this!! Have a great trip – I’m sure you will find a lot at Isam’s shop to like! I am planning a trip to West SriLanka in January and may not be in or near Galle. Can you recommend a trusted jeweler in Beruwala? Hi Susan, as much as I love jewellery, I don’t have a trusted jeweller in every town. If you would like to pop in to see the Salies family, they are on the way from the airport to Beruwala (on Galle Rd in Colombo and not in Galle town). It’s about an hour from Beruwala. If you’d like to have something custom made, I recommend popping in early on your trip so that they have enough time to craft the item. Thank you. We are coming on a package trip including airport transfers, arriving slightly before midnight. Not sure the bus will stop then! If it’s only an hour away we may take a bus or taxi one day we are there. Oh stopping then might be a challenge! A taxi won’t be too expensive, just go with an idea of what you want, maybe have some designs on your phone to show them. I have known Isam to deliver orders to Galle before, Beruwala is a bit closer so maybe he will oblige. Hello, I am traveling to Sri Lanka next month with my partner and very keen to get myself an early birthday present with blue sapphire! Thank you for the useful information I need to know about them and I will certainly be looking for you:)) Do you guys have emails so I can book for an appointment? I am planning a trip to Sri Lanka in the near future to visit one of my Sri Lankan friends that I use to work with in Qatar. My question is, What is the price difference between purchasing a blue royal sapphire in Sri Lanka & the USA? I haven’t been to the States so can’t comment, but obviously it depends on whether you get a good buy or not (tourists do occasionally get scammed too). I have heard of friends who have returned to Australia, who’ve had pieces valued at about 3 times what they paid for them in Sri Lanka. Personally, I always believe that your bet bet is to aim to buy something that you love rather than trying to make money – investing in jewellery requires a lot of specialist knowledge. Do you know if I can purchase an Aquamarine from salies ? I am only after the stone and was wondering if they have a selection that I can choose from? Oh definitely! There’s a few great ones in there – they’re really underrated stones, I think. Love that colour.